The Virginia basketball team battled through a night of uncharacteristically high turnovers and fouls plus a deficit after the first shot of overtime to survive an upset bid from NC State on Tuesday. The Cavaliers led throughout regulation, but saw a 14-point lead evaporate before securing a dramatic overtime finish to win 66-65. The victory pushed UVA’s record to 19-1 on the season and 7-1 in the ACC. The Hoos have won 10 straight games at PNC Arena dating back to 2010 (6-0 against NCSU and 4-0 in the NCAA Tournament). Indeed, Virginia overcame a sloppy night by its standards on both ends of the floor. Offensively, the visitors committed a season-high 16 turnovers, 8 on either side of halftime. The Cavaliers entered the game leading the nation with just 8.4 turnovers per game, though the Wolfpack push teams into trouble as they entered the game forcing 17.3 turnovers per game. No one was immune to the issue really as five different players committed more than one turnover. De’Andre Hunter and Ty Jerome had 4 turnovers each, while Kyle Guy, Jack Salt, and Braxton Key all had 2. The Hoos even got whistled for a 10-second call in the backcourt at one point. The turnover problems disrupted a strong shooting effort in the first half when the visitors made 11 of 18 shots (61.11%), then contributed to an out-of-sync second half that saw them make just 11 of 31 shots (35.48%). The Cavaliers covered up those problems with 32 points in the paint, 13 points off of 11 offensive rebounds, and a good night at the free throw line where they made 14 of 19 attempts (73.7%). 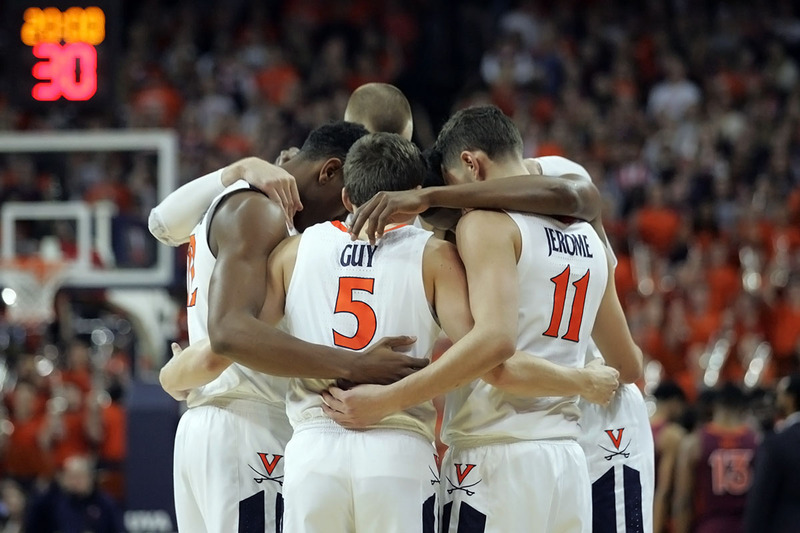 With the turnovers troubling the offense, UVA had breakdowns defensively too. The turnovers helped NCSU manufacture 14 fastbreak points, but the Hoos also gave up 13 second chance points on 16 offensive rebounds. State’s Wyatt Walker grabbed 5 offensive boards to lead the effort there. Plus, the Cavaliers committed 22 fouls in the game to match their season high in that category. They committed the same amount in the second game of the season against George Washington. NC State made 14 of 21 free throw attempts (66.7%) thanks to those fouls. Hunter and Salt both fouled out, while Jay Huff had four of his own. Mamadi Diakite had three. The gasp-inducing foul of the night came in the final seconds of overtime. Virginia had pulled ahead 66-63 thanks to two Hunter free throws with 5 seconds to go, but State’s Markell Johnson pushed the ball up the court and launched himself forward on a long 3-point attempt. Hunter challenged the shot and the two players drifted into one another for the foul call. That meant Johnson could step to the line with .9 left on the clock with a chance to tie the game and force a second overtime. However, he missed the first free throw and then inadvertently made the third attempt when an intentional miss may have created a tip-in chance. Johnson finished with 14 points, 6 rebounds, 3 steals, and 2 assists for the hosts. Walker added 11 points and 7 rebounds, while Torin Dorn had 13 points. Devon Daniels chipped in 10 points and 3 assists. The Pack just couldn’t put enough plays together to pull off the upset. While NC State came up short, Virginia made just enough key plays down the stretch to win. After Johnson gave the home team its only lead of the game with a 3-pointer to open overtime, the Hoos responded with an alley-oop from Key to Huff that turned into an old-fashioned 3-point play to tie the score 18 seconds later. Huff and Key made three more free throws to lift UVA back into the lead. Huff drew a foul on a spin move in the paint to get back to the line, while Key was fouled on a dunk attempt after slipping free behind the Pack defense. State pulled even again thanks to its own free throws, but Guy responded on the next possession. Jerome drove down the lane, appeared to lose the handle on the ball a bit, but then somehow flipped a pass toward Guy as he popped open for a corner 3-pointer in front of the UVA bench. That proved to be his only made 3-pointer of the night, which extended his run to 20 straight games with a made triple, and it set up Hunter’s final free throws and foul in the last 10 seconds that provided the final score. Hunter led UVA with 15 points, 5 rebounds, and 4 assists. Jerome recorded 12 points, 6 rebounds, and 6 assists, while Guy had 10 points, 6 rebounds, and 3 assists. Diakite, Key, and Huff all posted 8 points. Diakite added 5 rebounds, and 4 blocked shots, while Key topped the team charts with 8 rebounds. Salt chipped in 5 points and 4 rebounds.